This Is Why I Can Never Use Song Lyrics As My Facebook Status | Ooh Something Shiny! Smashing Pumpkins: Bullet with Butterfly Wings. I think I would just faint if I ever saw Muse live. I sing this song at the top of my lungs all the time. I am usually much more positive than this though. Maybe I just get it out of my system with cranky lyrics. I’d love to hear some other great lyrics if you’d care to share. I used to listen to a lot of angry women folk singers. Now…I just can deal with all that negativity anymore. Yeah, but back then you didn’t have to shave your legs, now you’re supposed to start plucking at your eyebrows and stop when you get to your toes. 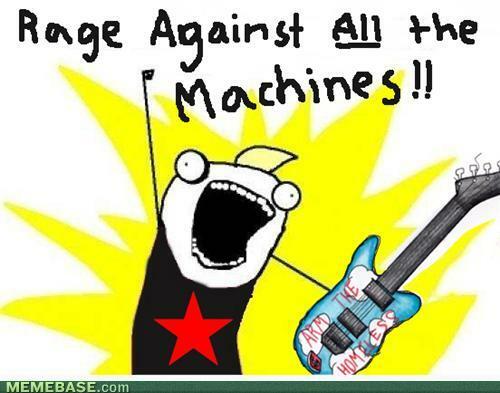 That “Rage against all the machines” version of Allie’s drawing just about killed me. BAHAHA. 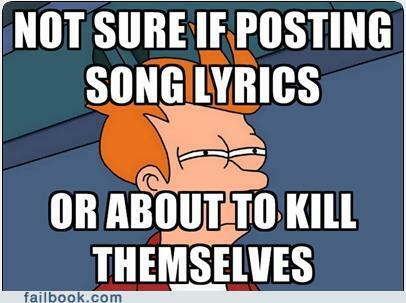 I have the same problem as the Fry macro: are they depressed and needing a pat on the back or quoting something? I usually Google to find out. Allie is my favorite meme!